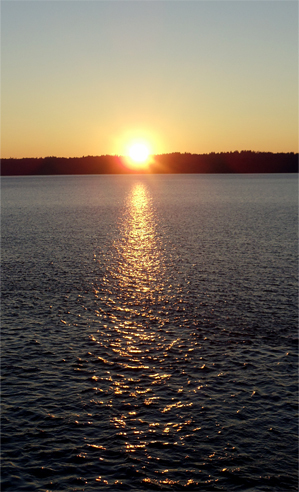 December sunset over Vashon. © Pat Paquette, 2013. This week’s aspects are largely positive – emphasis on large, seeing as how Jupiter is involved. The main event is Thursday’s favorable trine between Jupiter and Saturn. Jupiter is about growth, expansion, and exuberance, while Saturn is about limitation and structure. Usually, we think of “limitation” as a bad thing, but without limits, we’d have chaos. Structure itself is a limit. Think of the foundation and frame of a new home. It says, “This home is this size, in this place, built to withstand the worst weather in this region.” There may be some room for interpretation in the blueprint, but you’ve got a set plan. Once you decide on this design, all others are ruled out. The characteristics of Jupiter and Saturn obviously are at odds, and with difficult aspects between these two heavyweights, conflicts can erupt between forces for broader inclusion and systems designed to maintain the established order. However, when they are working in harmony, great things are possible. Left to his own devices, Jupiter can go way overboard and attempt to do too much, too fast, ending in a crash-and-burn. With the discipline and patience of Saturn, ambitious goals are more likely to end in success. If you’ll recall, Jupiter and Saturn were in a rare and powerful grand water trine in July. Back then, Jupiter, Saturn, and Neptune were all in the early degrees of the three waters signs. Neptune remains in early Pisces, but Jupiter and Saturn have advanced to the mid-degrees of Cancer and Scorpio, and will form two more trines, one this week and another toward the end of May 2014. This positive connection is something we can hang onto against the backdrop of the ongoing Uranus-Pluto square – and it is still very much active, as we can see in the uprising in Kiev. Even though Neptune is no longer part of the grand trine, the Moon in Pisces fills in for Neptune in a grand water trine on Monday. The Moon moves through signs quickly, so this “lucky” configuration won’t last long. Still, there’s something nicely symbolic about the Moon in the sign ruled by Neptune (according to modern Western astrology). It’s as though Neptune will be there in spirit. Look for developments related to events in July, both collectively and in your personal lives. If you began a project or relationship back then and have experienced setbacks, just a little effort this week can move you forward – and you do have to make at least some effort. I posted a note on Facebook yesterday saying I’d be late with this week’s forecast (I was struggling with the onset of a migraine) but that the week would be another positive one in general. Three readers left comments saying their weeks hadn’t been positive. I have to tell you that the previous week for me was not kind, either. So this is a good time to remind everyone that positive aspects such as the Jupiter-Saturn trine are no guarantee that you’ll have a great week, especially if you’re experiencing a challenging transit to your natal chart. My forecasts are in broad, general terms, and a quick look at the headlines confirms that the past few weeks have been relatively calm. The biggest news was the loss of a giant among men who passed peacefully at age 95, with tributes to remind us of what it means to sacrifice for truth and justice. The second biggest story, at least in the United States, was a gigantic snowstorm at a time of year when it does tend to snow. Of course, the folks who skidded off the road or froze to death likely didn’t have a “relatively calm” week. Speaking of accidents (and I’ve written this before), it’s hard to predict accidents with astrology. We can see the tendency or indications of an accident-prone period, but that doesn’t guarantee an unfortunate outcome. Further, admonishing someone to “watch out for accidents” isn’t necessarily helpful. A few years back, I had a client who fell on a loose stair step and shattered her hip. There was no way she could have seen that coming, even with a word of caution to “be careful.” At times like this, being an astrologer can be very frustrating. Back to this week, Mercury trines Uranus and squares Chiron on Tuesday. The trine with Uranus is signature for fast thinking and impulsive ideas. This is the light bulb flashing over your head, the eureka effect (just don’t slip getting out of the bathtub). Thoughts are so fleeting that you may forget them, so keep a notebook handy and write them down. Don’t assume you’ll remember them later. The Mercury-Chiron square also has a positive side, in that human suffering comes into greater focus. With Chiron in Pisces, we can have compassion for those less fortunate, but we won’t necessarily do anything about it. Sometimes we just don’t know what to do. I genuinely hope that we’ll see at least one headline this week concerning solutions to poverty, unemployment, and help for victims of wars and natural disasters. I usually don’t write about quincunxes, but I do want to mention the Mars-Neptune quincunx on Friday. Mars is in Libra, the sign of his detriment. Mars operates best when he can be direct and get straight to the point, and Libra is too considerate of others to do so. Not that Libras don’t get what they want by other means, and that’s the risk here. Neptune can be fuzzy and confused, if not downright deceptive. The question is often asked in relationship counseling whether it’s OK to lie to a partner and under what circumstances. My general take is that if you’re lying to spare your partner’s feelings – and you need to be ruthlessly honest with yourself about your motivation – then it’s appropriate. If you’re lying to spare your own feelings or because you don’t want to get caught doing something you shouldn’t have been doing – especially if you agreed not to do so – then it’s time to put on your big-boy/big-girl pants and ‘fess up. I’ve written that I’d have something to say about comet ISON, but I’m continuing to hold off, because observers still aren’t sure what happened to it. They’re waiting until what’s left of it gets farther away from the sun to determine whether it’s dead or mostly dead. After an initial announcement that it was dead, they said they’d called it too soon and that it appeared that something survived and was growing. That would have been symbolic indeed. Sadly, it now appears that there’s nothing left but a cloud of dust. This entry was posted in Forecasts and tagged Chiron in Pisces, Comet ISON, grand water trine 2013, Saturn, Uranus-Pluto square on December 8, 2013 by Pat.